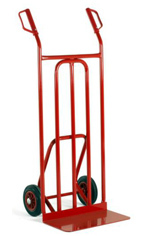 High quality Hand trucks, Sack trucks and Carton trucks to suit a wide variety of applications. 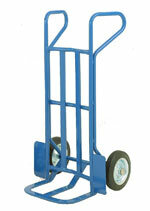 This is only our standard range; we will make bespoke trolleys to suit any application. So if you do not see anything that suits your application please contact us. Robust welded tubular steel construction with steel toe plate. Safety handles. 260mm pneumatic tyres on plastic rims. 250 Kg load. Solid toe plate 250 x 500 mm. Ideally suited for the movement of cases, cartons and crates. High back allows for stacking of load. Continuous loop handles give convenient handling at all angles. Bright zinc plated wheels with black solid rubber tyres. Finished in blue epoxy. Robust welded tubular steel construction with steel toe plate. 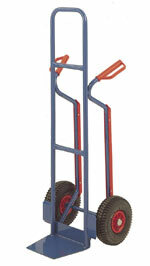 Colour RAL 5010 blue, safety handles, 260mm pneumatic tyres on plastic rims, hub with roller bearing. 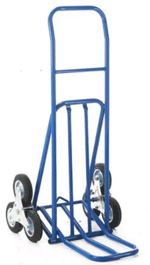 This stairclimbing trolley has been fitted with with star wheel system to privide the greatest ease in transporting goods up and down stairways. It also has a unique feature as it can be folded away for easy transport and storage. This is a high quality sack with a stainless steel finish. Perfect for use in a clean environment such as a hospital. 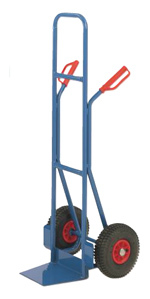 This comes as standard with 260mm dia pneumatic wheels and hand protection handles. An ideal sack truck for the entertainment industry.